Kyle Felker works from his home on infrared images taken of both the Camp Fire and the Woolsey Fire. 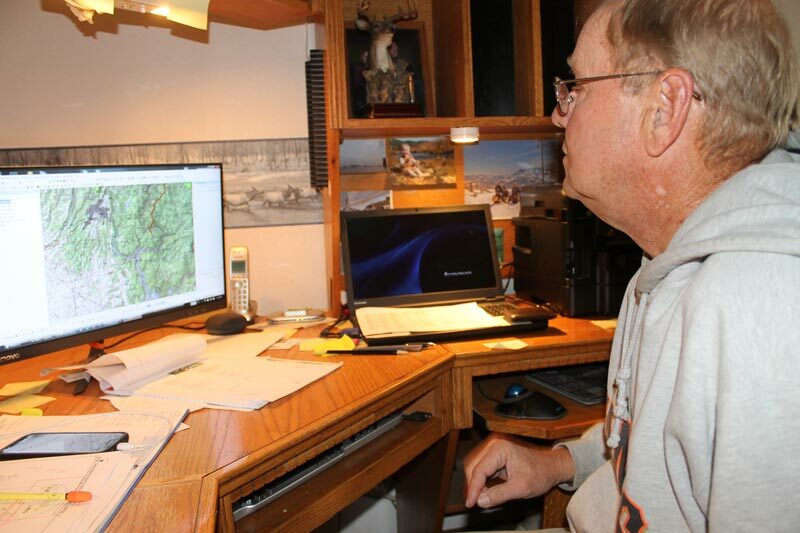 From the vantage point of a comfortable desk chair in his own home study, one Plumas County resident is doing sophisticated computerized infrared map work that thousands rely on both in the fire zones, at command centers and on the web. Kyle Felker of Quincy works for NIROPS — the National Infrared Operations — a nationwide program that uses aircraft to fly over wildfires at night for thermal infrared detection and mapping. While Felker has been doing this kind of work for 15 years, NIROPS has been in existence since 1969. To put it simply, a NIROPS aircraft flies the mission at night, sends the highly detailed information to Felker who then puts his spin on it and releases it to fire command centers. “I’m the guy on the ground who does the maps,” he explained. NIROPS has two aircraft, a Cessna Citation jet and a twin engine Beechcraft King Air, Felker explained. At this time, one aircraft is working the Camp Fire in Northern California; the second is working the Woolsey Fire in Southern California. At another location, Felker said he has a partner in working maps. Rachael Brady in Redding has her name on the fire map information from the Camp Fire. Felker’s name appears on everything for the Woolsey Fire, although they both work on all maps. At the request of a fire agency for an incident like the Camp Fire, the incident places and Infrared Flight (IR) request in to NIROPS. In turn a number is generated with a local dispatch unit and incident orders and Infrared Interpreter (IRIN) such as Felker. A plane then flies the fire at night and delivers the imagery to the IRIN. Fires generally tend to die down or lie down at night, plus there isn’t the added air traffic of helicopters and planes dropping water and fire retardant onto the fire. Air command also doesn’t fly at night, so it’s the perfect time for NIROPS to be in the air. Felker (IRIN) interprets the imagery with his specialized computer program and delivers maps, logs and GIS-ready files to the incident command center. Inside each aircraft is the Phoenix Imaging Systems and AirCell telecommunications equipment, Felker explained. Each aircraft is capable of doing 300,000 acres an hour, although the jet is far faster. And they can easily cover several fires in one night. In fact NIROPS has been able to work 30 incidents or more in a night’s work, Felker explained. The highest number they’ve worked in a night was 52. “It’s really a cool job because I could be anywhere,” he said about his location. He just needs the Internet link, his computer and the appropriate program. Scanners and technicians are based at the National Interagency Fire Center in Boise, Idaho, Felker explained. The pilots are based at the U.S. Forest Service Intermountain Region. And IRINs, like Felker, are from many federal, state and local agencies. Felker’s background is with the Mt. Hough Ranger District on the Plumas National Forest where he worked in GIS or Geographic Information Systems. Technical support for research and development is provided by the USFS Remote Sensing Application Center, NASA and private industry, Felker explained. Program oversight, Geographic Area Liaisons, and training cadre come from the pool of IRINs such as Felker. Coordination is facilitated by the Aircraft Desk at the National Interagency Coordination Center at NIFC. During fire activity regional or national infrared coordinators are used and that includes private vendors. Nationwide there are about 30 people involved in the program, according to Felker. Infrared detection is capable of detecting a heat source as small as six inches from a high altitude. “You could pick up a dinner plate-sized spot,” Felker said about defining a slightly larger hot spot. Showing some of the red circles indicating heat on one of the maps on his computer screen, Felker said that what was being seen was probably a stump or a post that was burning. As Felker looks over the images he’s working with he can tag specific areas. For instance, he’s keeping a close eye on the Bucks Lake Wilderness Area. “That’s my baby,” he said. And, understandably, he’s keeping an eye on the cabin he’s been building for the past 12 years in the Bucks Lake area. At this stage of the Camp Fire, slow-growing flames were inching toward the Four Trees area, a favorite spot for snowmobilers and others along the Quincy/Oroville Highway. Showing one image on his computer, Felker said that the aircraft flew the Camp Fire between 5 and 7 p.m. on Nov. 9. The fire had already passed over a large portion of Paradise. The perimeter of the fire showed up in red where active flames were occurring as the blaze continued toward Chico and other parts. Paradise itself was white and yellow indicating how hot the area still was. The great thing about today’s technology is that Felker can send his information to fire command. There someone can break it down so that anyone in the field with an iPhone can receive mapping information for their particular section. While showing the maps, Felker has more detailed information available. He can show the history of fires within an area or he knows dozer lines or hand lines made by people on the ground. These don’t just happen. By using the fire maps, people can determine exactly where to put their resources. Felker got special permission to share some of the maps used by incident command and in the field by firefighters for this story. Some are classified and those aren’t included. Indicating a plume of smoke coming off the initial phase of the fire, Felker said that the smoke was not only filled with toxins, but embers. Those embers also glow red. The clouds “drop fire out of the sky,” he said about how wind and the atmosphere work to spread hot fires. Indicating a black and white map — a sharp contrast to the full color maps he’s been showing — Felker said that it “helps me define the edges” of the fire. The white indicates cold areas on this map, while the black shows the hot areas. Felker sees landscapes and routes on his maps. He sees that something has moved he said he’s immediately on the phone to his lead contact. He just had occasion to do that very thing on the Woolsey Fire. And when this happens, fire command wants to have the information immediately.